This post is part of a series about the research of faculty members who are seeking to understand the impact of climate change here in Connecticut, and to work towards environmentally sustainable solutions. Connecticut is home to an abundance of wildlife and one doesn’t have to go far to find it. With the unique not-quite-urban, not-quite-rural landscape in much of the state, this means humans are living among wildlife, oftentimes in our own backyards. Keeping track of the animals and their numbers is important information for decision making, management, and conservation for animal populations. 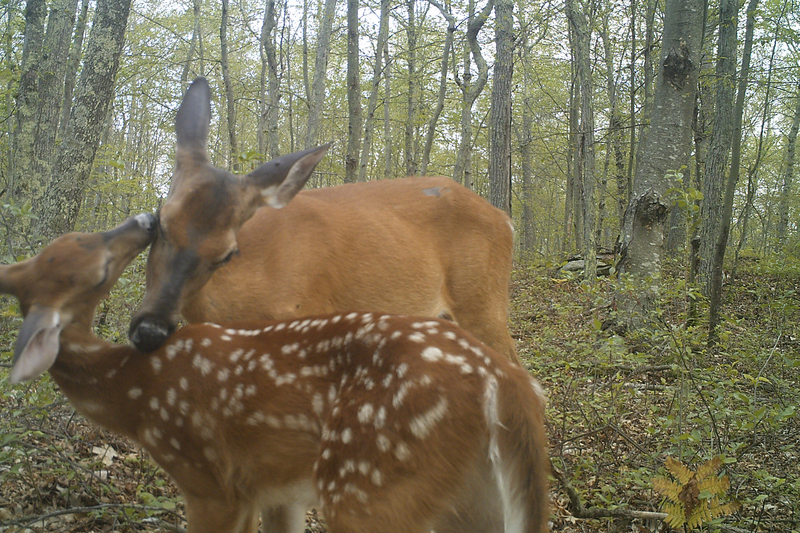 Researchers at UConn are addressing these challenges using new technology and citizen science, to learn more about the animals and the places where both people and wild creatures live. Associate professor of natural resources and the environment Tracy Rittenhouse and researcher Jennifer Kilburn ’18 MS have been tackling the question of how deer density varies across the state, by developing better methods to estimate deer abundance. In terms of abundance, in the northwest hills the population is relatively low, with less than 20 deer per square mile. For areas closer to the shore, deer population densities are more than 20 deer per square mile, says Kilburn. High deer densities can mean a lot of things for the landscape beyond just the eating of plants, especially native plant species. Deer can also carry ticks, ferrying them and any diseases the ticks may be harboring wherever they go. It is often said that the main predators for deer in the eastern U.S. are cars and hunters, and that is true, Rittenhouse says. Hunters play a vital role in natural resource management. Besides helping to keep game populations at healthy levels, hunters supply researchers and natural resource managers with valuable information, for instance, by reporting sightings of other animals while out on the hunt. Rittenhouse is studying some of these other animals as well, including bobcats, cottontails, bats, and amphibians. This type of research is vital to better understand the existing and changing biodiversity within the state. Many wildlife researchers have begun to rely more on ‘camera trapping’ to gather data in a more cost-efficient way. Other research methods often require repeated capture and handling of animals, which are marked with ear-tags or tags similar to those put in dogs and cats and then released. Researchers continue trapping to determine how often a specific individual is recaptured. The resulting data are excellent, but the methods are labor-intensive, and that means expensive. Camera trapping – placing cameras in wildlife habitat that can capture images remotely and then analyzing the photos taken – is a completely different way to study wild animals. But it raises many questions. “How do you estimate abundance of unmarked species?” asks Rittenhouse. “How do you know you aren’t counting the same animal multiple times? What is the best spacing of cameras? What is the best time interval to take photos?” These are all examples of the questions researchers are working to answer, she says. Rittenhouse’s current bobcat density project relies on cameras and she hopes to find the ideal placements to gather data on bobcats and other species. She is also calling on the data of citizen scientists through a platform called iNaturalist, where she and collaborators at the Connecticut Department of Energy and Environmental Protect (DEEP) started a project called the CT Bobcat project. An example of the importance of population management can be seen in the deer population over time. Deer were heavily hunted in the past and the population plummeted. In the 1930s, conservation efforts were put into place and the numbers recovered – almost too well. With overabundance comes change to management practices. “There are places across the state where deer density is especially high, such as along the coast. In areas where you have a high number of deer per square mile, hunters may be allowed to harvest more deer to help manage the population,” says Kilburn. Data on abundance are essential for making these important decisions. Another extensive citizen science project underway is the Connecticut Bird Atlas. This project is relying heavily on volunteer data, from hundreds of bird watchers, enthusiasts and amateurs alike, from across the state. The project is being led by researchers Min Huang in the Department of Natural Resources and the Environment, and associate professor Chris Elphick and assistant professor Morgan Tingley, both in the Department of Ecology and Evolutionary Biology.